Thank you for participating in the GO RED campaign on Feb. 2nd 2018. Awareness makes all the difference! Below are three options that make it simple to light your building/space RED! Here we have a rental light and the case. You will get 4 of these lights ready to throw in the back of an SUV, and GO Red! We are please to offer a simple D.I.Y. rental option! Rent some cases of Battery Powered LED UP-Lights. They are ready to use and set to the color RED. Hit the "ON" button and place the light wherever you want. These lights can be used outside, too! Note: Pick up/return is the responsibility of client from/to NEL's Germantown Warehouse. Create an effect like this on your building. The lights will go over 20' high! Our team will install 30 UpLights. Because These Lights are Battery Powered, they can be put anywhere you want! Columns, Wash a Hallway Area, Shine them on your building, the possibilities are endless. St. Thomas Midtown has transformed their building for several years and we get lots of compliments on this one. Make a Dramatic IMPACT from anyone that looks at your building, from all over town! 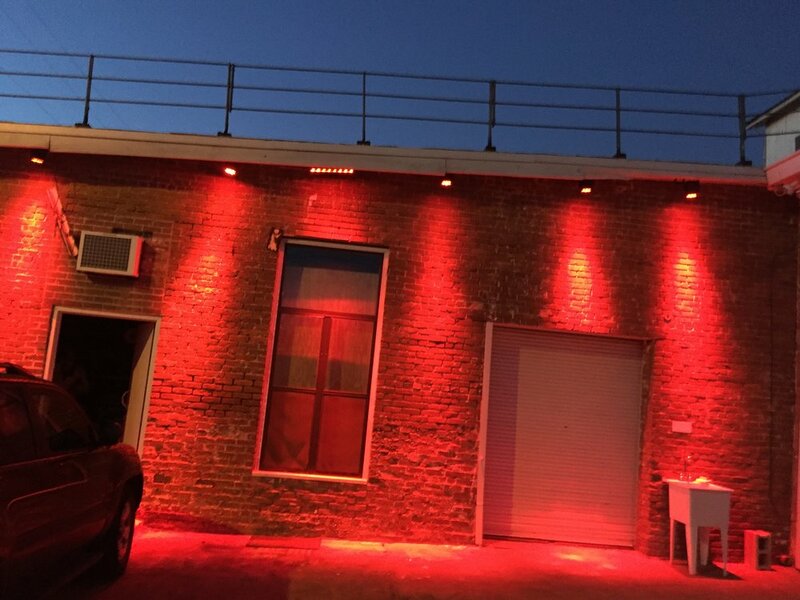 Our team will install 40 High Powered LEDs to saturate one side of your building! This is our most popular option! *GO RED Pricing is Valid Until Jan. 12th, 2018. Subject to Availability. Subject to Change.